Norwich Central Baptist Church put on a five star performance to win the Norfolk Christian Football League’s Bishop Maurice Woods cup final on Saturday morning (April 14), securing a league and cup double for the second year in a row. Reports by Keith Morris and Mike Culwick. They were playing St John’s Cathedral in the final at the Football Development Centre’s Field of Dreams, in Bowthorpe near Norwich in front of an enthusiastic crowd of over 60 people. 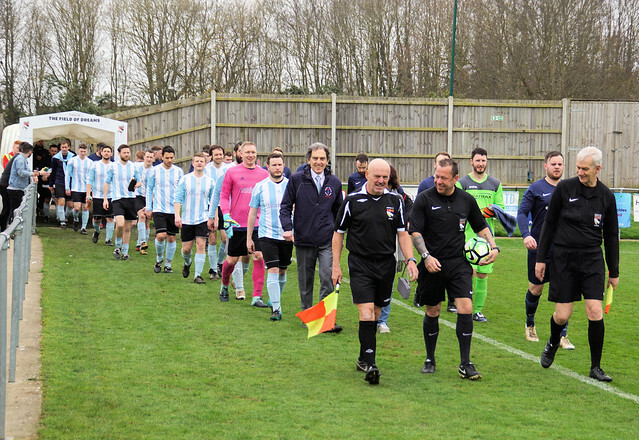 NCBC started off in positive fashion in a physical encounter and referee Darren Syder had to use his yellow card on several occasions for both teams. Ben Jervis put NCBC ahead in the seventh minute with a top quality shot from outside the box into the top right hand corner, leaving St John’s keeper Johnson Howard with no chance. St John’s kept battling but Daniel Jervis doubled the lead with a low shot in the box after 20 minutes, and added his second, and a third for NCBC, with a header after 34 minutes to take control of the game. Into the second half, and not to be outdone, Ben chipped the keeper from outside the box after 50 minutes to make it 4-0. On 65 minutes, Daniel chipped the keeper himself only to see his shot rebound off the crossbar, denying him a hat-trick. Substitute Michael Sargeant made it 5-0 to NCBC on 82 minutes with a header from a cross to finish the game off. The medals and cup were presented by Sue Stapleford, whose husband Tim, was a former league chairman. Daniel Rust of St John’s was also presented with the league top scorer trophy for his 29 goals. In the afternoon Stalham Baptist took on Sprowston Radicals in the Wroxham Road Shield Final, also at the Field of Dreams. Both teams soon settled down to play some good entertaining football with Sprowston putting pressure on the Stalham defence and created several chances but Stalham defence held firm. Kyle Appleton broke the deadlock after 20 minutes to put Sprowston in the lead with a well-taken goal. Stalham began to get back into the game and in the last minute of the first half equalised through Peter Timothy when Sprowston failed to clear their area. The second half saw Sprowston put more pressure on Stalham and several chance to draw ahead with some excellent saves from the Stalham keeper. Stalham again held firm and gained in confidence with good attacking play putting pressure on Sprowston defence and took the lead through Chris Bolden with a hotly disputed goal with Sprowston claiming several players were offside, but the decision was upheld and Stalham held on to eventually win 2-1. The game was played in a very sporting way and both teams given credit for a good close fought final. Ron Skivington, who played for Stalham for several years, presented the teams with their medals and Stalham with the shield. League sponsors for finals day were Witard Road Baptist Church, AGC Services, Alan Lawn and Norfolk Elite Construction & Landscaping. To see a full picture gallery of both games see above or click here.